So what's the best way to follow a sale on the Dovetail Store? The exact same sale but on Steam apparently! From today until the 29th April Steam is running a sale on some of our add-ons and for the first time it includes the hugely popular GWR Pannier Tanks at 25% off. Click this link to see all of our DLC on Steam or click on an image below to view a particular pack. Note: As usual in the first few hours of any sale Steam will have a complete meltdown as so many people try to access it with some sale prices not showing or the site being completely unavailable - you may need to refresh the page if it doesn't show some of the offers or maybe wait for tomorrow when it's settled down. From today until the 18th April the Dovetail Store is running a sale on some of our add-ons and for the first time it includes the hugely popular GWR Pannier Tanks. If you haven't used the Dovetail Store before it is simply a method to purchase a standard Steam key that you activate and it adds the product to your account. All safe and above board, and best of all we don't have to pay commission to Steam which means we can invest even more time in making our products the best that they can be. Click this link to see all of our DLC on the Dovetail Store or click on an image below to view a particular pack. Today we have a look at the cab of the NER Class C / LNER J21. This was quite a project as the class underwent a lot of changes, including a mix of 4 different types of brakes all of which are available as options with appropriate gauges, and in advanced mode they will have totally different methods of operation. 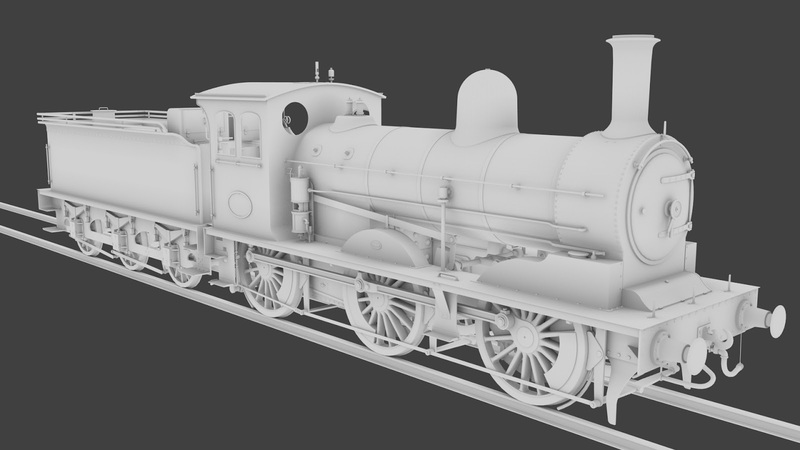 First off, a majority of the class were built with just a steam engine brake. Here you can also see the twin whistles and boiler gauge in the centre and near the roof on the fireman's side is a Raven Cab Signalling Repeater which shows the state of the next signal. Sadly TS doesn't support reading the next signal state if it is green but you can check the next red/yellow signal and the distance to it so the current plan is to show on the repeater if a signal in the next 500m is at danger or warning. Some Class C's had Westinghouse brakes instead of steam brakes (and some had both) which is seen here. Also this engine has had steam heating fitted for keeping those passengers warm. Now out of the NER era and into the LNER: the Raven repeater is gone, a vacuum brake has been added to go with the engine steam brake and a different regulator lever has been fitted (these don't appear to be era specific and were quite random based on what was available during major refits). 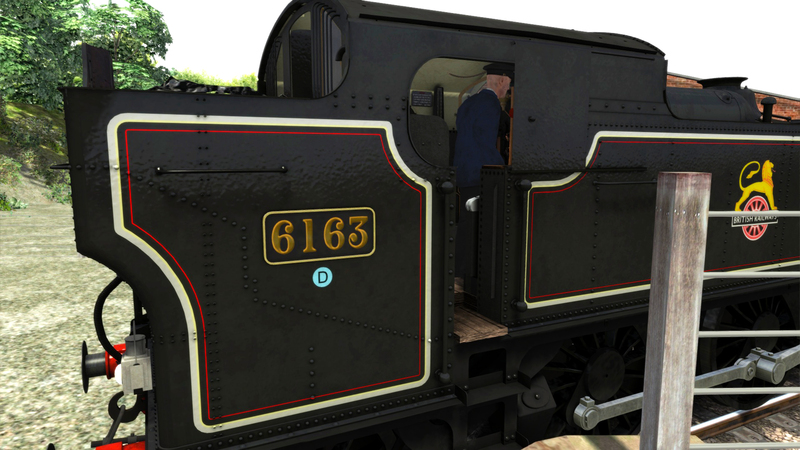 Another significant change is that the injectors which were originally mounted on the sides of the boiler are now inside the cab, a change which is also reflected on the outside model (see previous blog post). Finally a much later version. Another style of regulator lever has been fitted and the braking is now operated by a Dreadnought ejector. The twin whistles on the roof have been removed and replaced by a single LNER style whistle on top of the boiler in front of the cab sheet and a pull lever mounted on the roof. All appropriate parts will be available for the relevant eras and will be selected using the scenario loco number - and of course we will be providing data to the Locomotive Number Generator to make it all as simple as possible to get exactly the set up that you want. So that is all of the modelling completed. After unwrapping and texturing everything we'll be back soon with some in game pictures. 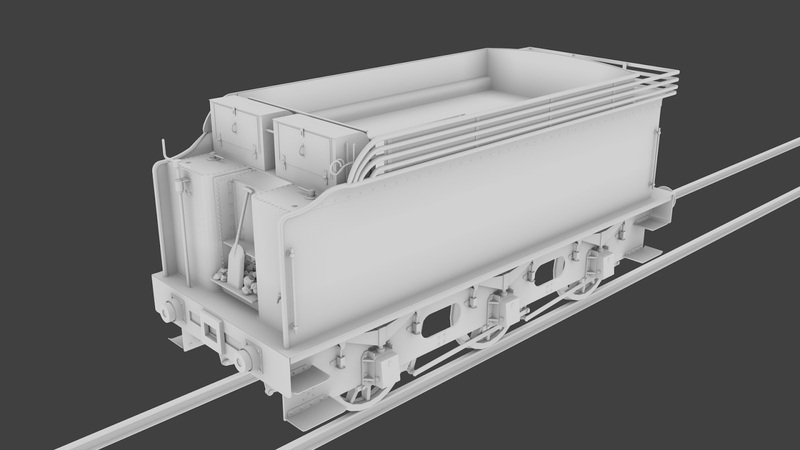 Work continues with the J21, this time on the tender. In 1915 the D shaped holes in the frames were changed to oval shapes. Sometimes wooden planking was added around the upper area to stop smaller pieces of coal from slipping through the bars. To increase capacity some tenders had 2 extra bars added and the planking was also raised to match. Vacuum, air and heating pipes are available options and will be automatically synchronised with the attached engine. 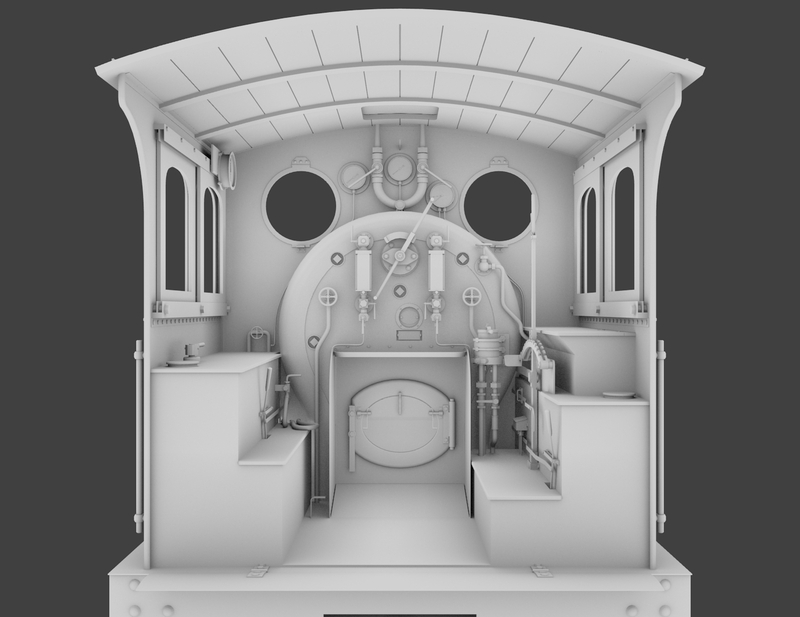 Next week we'll bring you some more work in progress, this time from the driver and fireman's office. 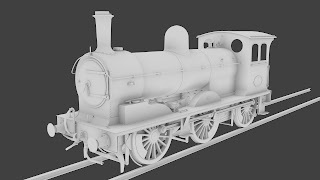 Works continues on the NER Class C/LNER J21 and here a few WIP images. An early saturated boiler version sporting a safety valve bonnet with Ramsbottom valve, dual whistles, injectors on the outside of the boiler and a smokebox wheel handle. This version has slide valves rather than piston valves, hence the altered smokebox front. Note that the safety bonnet has gone and been replaced with a platform mounting two Ross safety valves and the brake gear is now mounted outside of the driving wheels. Finally the extended smokebox and dome mounted further back shows that this version has a superheated boiler. Also seen is a Gresley anti-vacuum valve along with a "wind jabber" behind and on top of the chimney respectively. 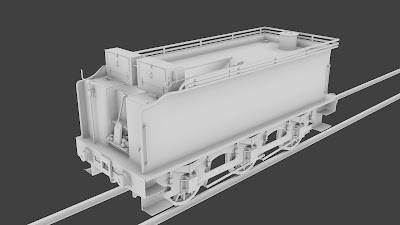 A mechanical lubricator has been fitted on the right hand side, driven externally by the centre wheels, these were also driven between the frames on some versions which will also be an available option. Finally the safety valves are now mounted directly to the boiler and the whistles on the roof have been replaced by a single whistle in front of the cab sheet. More work in progress to come next week. Hey it's been a whole month so it must be time for another sale! 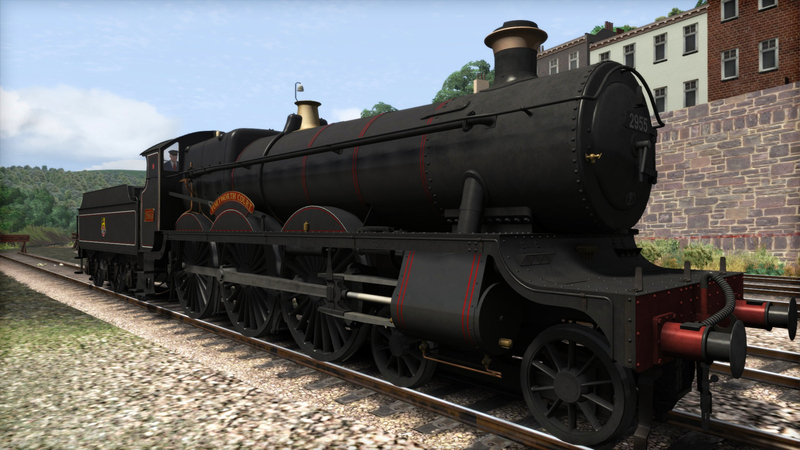 The GWR County is at it's lowest ever price with 50% off, the highly rated LNER Peppercorn K1 is 60% off as are the GWR Small Prairies. Many other add-ons are half price. Finally, we make good on our promise of 3 years ago and begin work on the LNER J21! Apologies that it took so long but this was by far the hardest locomotive that we have had to get hold of all of the information required and we will not start work until we can be sure of creating a detailed, high quality product. But before we begin with WIP pictures, a little background information..
By 1885 the North Eastern Railway’s freight locomotives were in a dire state. Many were due for withdrawal and none were powerful enough to manage the increasing requirements. The New Locomotive Superintendent, T.W. 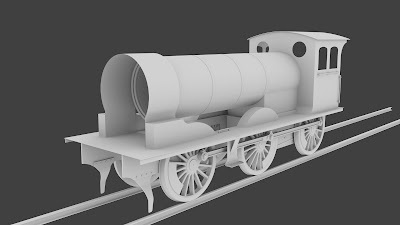 Worsdell, set out to fix the NER’s issues by introducing a new locomotive based loosely on his previous GER J15 designs but also incorporating old Fletcher ideas and adding larger fireboxes, cylinders and cabs. Production of the new NER Class C began in 1886 and carried until 1894. During this time a total of 201 locomotives were constructed for freight use under the NER. 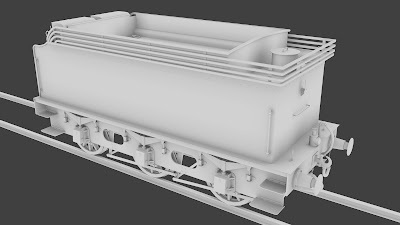 They featured 2 main variants; 171 Compounds (Class C) and 30 Simples (Class C1). The Simple batches of Class C’s were introduced by T.W. Worsdell’s younger brother, W. Worsdell who took over the role of LS after T.W. retired due to poor health. W. did not like compound designs and when reports of coal savings by Compound locomotives fell short deemd that a programme of Compound to Single conversion for all NER locomotives should be considered. The rebuilding of Class C's into Class C1's began in 1901 and took 12 years to complete at which point the entire class became known by as Class C. Many rebuilds featured Joy Valve Gear but 75 featured Stephenson’s Valve Gear alongside larger cylinders and piston valves. Many also received Superheaters in later years but with repairs and replacements any locomotive could just as easily lose any upgrades throughout its life. In 1923 the NER was absorbed into the LNER and the Class C was reclassified as the J21. Under the LNER the J21’s would see a change from their mineral/freight intentions and would frequently pull passenger services. During this time they also received even more changes and upgrades. Withdrawals of the J21 began in 1929 but surprisingly as many as 83 were still running when the railways were Nationalised in 1948, quite an incredible feat on the part of the Worsdell Brothers, and the last was withdrawn in April 1962. The sole survivor, BR No. 65033, is currently preserved at NRM Shildon in BR Black livery and is awaiting funding for restoration to running status. 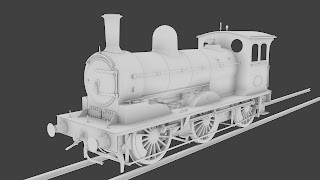 The J21 for Train Simulator will be published by our good friends at Steam Sounds Supreme who we are delighted to be working with again and who will be providing a top quality sound set for the locomotives. There are so many variations of the J21, the most noticeable being the saturated and superheated boilers, but we usually start with a single variant and model that to completion before modifying and duplicating parts to make other versions. In this case we are starting with the non-superheated version with the shorter smokebox. 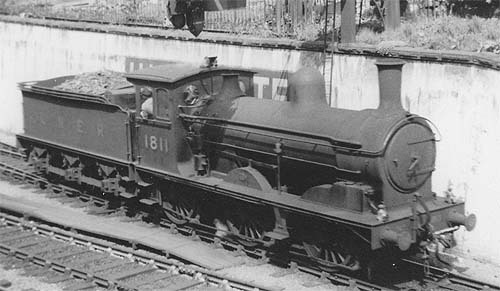 Note the side injectors which were moved to the cab in later years along with the original style of tall chimney which all-but vanished in later life due to gauging issues on the GER. This image incorporates some later parts and is a bit of a mash up as it has parts for steam heating, air brakes, vacuum brakes and a mechanical lubricator. Many of these parts will be optional or based on specific times and locations as we attempt to do justice to the huge number of changes these engines went through during their 75 years of service. More WIP images to come in the following weeks.